The perfect GC for many applications that saves space without compromise on functionality and performance. 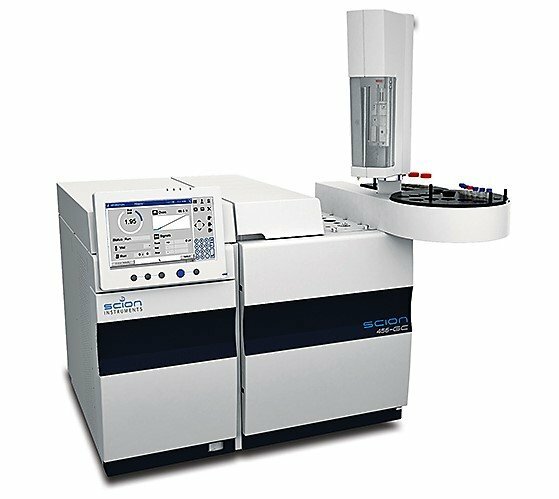 Capacity for 2 injectors , 1 GC detector plus a mass spectrometer makes the SCION 436 a perfect match for your analyses. A 9 inch touchpad provides direct access to all GC functions and basic tuning. When your requirements demand more functionality or you want room to upgrade, the SCION 456 easily meets your need. Supporting three injector and four detector positions (including the mass spectrometer) with full independent access, no other GC system provides this capability. Scion 456 GC is the platform for over 50 different configured analyzers for petroleum, petrochemical, and specialty gas application. A staff of highly experienced chromatographers can assist you to build a special analyzer to meet any application need.The perfect GC for many applications that saves space without compromise on functionality and performance. Capacity for 3 injectors , 3 GC detectors plus a mass spectrometer makes the SCION 456 a perfect match for you analyses. A 9 inch touchpad provides direct access to all GC functions and basic tuning. Regardless of sample type or throughput, SCION GC’s can provide an automated solution to meet your requirements. Two SCION sampler options are available, the 8400 and 8410. Each can be tailored to meet specific sampling needs and workloads. Third party samplers like TELEDYNE TEKMAR Versa head-space sampler and CTC PAL-xt systems are easily integrated. The SCION (SQ) GC-MS is designed for today’s fast paced analytical laboratory. Innovative design features such as a Lens-Free ion path, heated ion optics and an Extended Dynamic Range (EDR) detector enable the SCION SQ to deliver accurate quantification and identification on a routine basis, even in complex matrices. As ions pass through a mass spectrometer a significant portion is lost every time they encounter a lens. Due to its unique design the SCION SQ doesn’t have any lenses thus increasing the sensitivity of the instrument by reducing ion losses. Another major advantage of having no lenses the source is the only part to clean, so you can spend more time analyzing samples and less time maintaining your instrument. The SQ is integrated with our SCION 436 or 456 GC as sole or as additional detector.